A multi-university consortium of astronomy professors, which counts among its members Haverford's Stephen Boughn and Bruce Partridge, has been awarded $10 million by the National Science Foundation to construct the Atacama Cosmology Telescope (ACT), a state-of-the-art instrument that will be located in the desert of Cerro Toco, Chile. 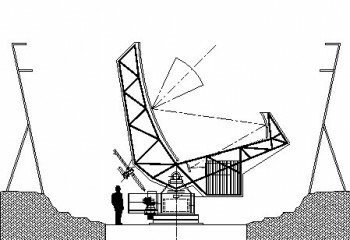 The telescope will be used for measuring the Cosmic Microwave Background (CMB), leftover heat radiation from the Big Bang. ACT makes use of state-of-the-art detectors and amplifiers being designed and built in part by a recent Haverford graduate, Randy Doriese (formerly Dorwart) â€˜96, now working at the National Institute of Standards and Technology in Colorado. When the telescope is ready for use in either late fall or early winter of 2006, it will be able to measure the CMB with better resolution and sensitivity than any existing telescope has achieved.“We want the detail to be as fine as if it were viewed with the human eye,” says Partridge.“Because it's a ground-based instrument, we can build it biggerâ€”the bigger it is, the finer the detail will be.” These results will be beneficial to Partridge's research concerning fluctuations in the intensity of the CMB. The consortium responsible for the ACT's constructionâ€”which includes professors from Princeton, the University of Pennsylvania, Rutgers, and Columbiaâ€”was formed with the goal of creating high-precision, high-resolution images of the CMB. Boughn and Partridge helped draft the proposal to NSF. “We were interested not only in the construction of the telescope and the science it will yield, but in the possibilities for Haverford students,” says Partridge, who points out that several Haverford students will be involved in projects related to the ACT's science. One student, Sarah Burke â€˜06, will spend this summer assisting professor Mark Devlin at Penn, another consortium member, with his measurement of temperature fluctuations in the CMB.